Whilst British orchestras continue to regurgitate much of a similar repertoire (because it is �box office�) there are numerous British composers who deserve to be dusted down and their works heard. Contemporaries of Elgar and before fall into this category. We have to be grateful to ClassicO and Hyperion for continuing to provide good recordings of much forgotten or previously lost British music. Since Beecham and Robinson have gone there is no worthwhile output by the BBC and it seems there are less than a handful of conductors who have made the effort to delve into the recesses of music libraries and recommend works to recording companies. Of the few that have, Mackerras, Bonynge, Penny, Lloyd-Jones, Corp and Bostock are notable. In this recording, the rarely heard gifted musicians of the Royal Northern College are brought to the fore and given a well-merited public airing. York Bowen, born at Crouch Hill, London, enjoyed a comfortable and privileged childhood. His musical talent was special, as he won the prestigious Erard Scholarship to the Royal Academy of Music, when only 14. Both he and Bax were contemporaries at the RAM, where they remained until 1905. Bowen quickly built a reputation whilst still a student, and for a while overshadowed Bax. Only after the Great War was Bowen's name in decline and Bax's was on the rise. The CD notes tell us that Bowen became an experienced concert pianist and fluent composer, becoming a familiar name in his teens. Sir Henry Wood conducted his youthful tone poem, The Lament of Tasso at a Promenade Concert in 1903, and Bowen first appeared at the Proms as a pianist in his own First Piano Concerto when still only nineteen. A Second Piano Concerto, in one movement, was programmed by the Philharmonic Society at Queen's Hall in 1906, and a Symphonic Fantasia was taken up by Richter the same year and played in London and Manchester. Bowen later returned to the Philharmonic Society for the first public performance of his Viola Concerto in March 1908, and in September that year a Third Piano Concerto appeared at the Proms. Bowen continued composing throughout his life, and along with a large body of piano and chamber music, he later produced a Violin Concerto, Third Symphony and Fourth Piano Concerto. As pianist, he made the first ever recording of Beethoven's Fourth Piano Concerto with his own idiosyncratic romantic cadenzas in 1926. Bowen's Second Symphony was written between 1909 and 1911. It may well be that its revival by the Royal Northern College of Music Symphony Orchestra is only its second performance. The symphony, written in the conventional four movements, is scored for a large romantic orchestra with six horns and, unusually, two harps. The manuscript full score is held in the Bowen Collection in the library of the Royal Academy of Music in London, incidentally. A dark fanfare by trumpets and horns opens the work which develops with an energetic first subject, whose colour and harmonies lead one to consider that this work is possibly of Russian origin. Certainly the work owes something to Tchaikovsky, whose Pathètique symphony had at that time been heard in London. An emotional dialogue between strings and horns leads to a feeling of desperate anxiety before calming down and flowing into much brighter, yet still tense, subjects. Horns and wind continue to figure prominently in the Lento second movement before the strings enter to offer interesting texture. Violas and cellos carry a romantic theme in Tchaikovsky likeness. Sometimes the wind carries lines, which have a Debussian character. The Scherzo livens the pace of the work and contains some vibrant ideas. The work is of meandering purpose with no particularly memorable themes but it is competently structured and well scored. Frederic Austin's music is remarkably forward-looking for its day. With complex and colourful orchestration, he is skilled in providing an extensive use of strings, which we are told could anticipate the Strauss of Metamorphosen. In producing such a rhapsody as this in 1907, with folk-like themes and impressionistic elements, Austin was at the leading edge of British music. The folksong rhapsodies of his contemporaries took several years to be heard, and much longer to enter any repertoire. Indeed if Austin, a leading British baritone of his day, has a contemporary composer of the Edwardian period it is Delius who could be called to mind. One can believe that Bax was influenced by Austin rather than the other way round. They would have frequently met at the house of their mutual friend, Balfour Gardiner, where Bax was �de facto� the resident pianist to Gardiner's circle, ready to play through a full score of new works which Gardiner might be considering to use in his concerts. The standing of Austin's music was such that when in 1915 Beecham launched a series of three concerts of British music, a work in the final programme (15 May 1915) was Austin's Spring. On that occasion the programme notes stated, "it breathes the very spirit of spring, the season most fully expressed in English music and in English poetry. Freshness, more than energy, characterises the music, for the rhythms, though irresistible, create no sense of striving, but have the calm freedom of the vernal forces of nature.... The themes vary in emotion from contentment to gaiety and rapture, the gladness of the opening subject being the dominant note." Austin's circle of friends included Percy Grainger, Cyril Scott, Roger Quilter, Vaughan Williams, Holst and Delius and it is likely that his style was to some extent tinted by theirs. As singer, Austin sang the premières of a number of their works - including the first performances of Delius's Sea Drift during 1908-9. Much of Austin�s output is orchestral � a Symphony in E minor, another overture, The Sea Venturers, a symphonic poem Isabella, much theatre incidental music, some film scores and a piano concertino - but he also wrote chamber music, and, perhaps not surprisingly, an appreciable amount of vocal music, including a 25-minute choral setting of Pervigilium Veneris. All his big works are clearly the product of a warm-hearted and generous spirit: they have real rhythmic drive, and their orchestration is extremely engaging. The Symphonic Rhapsody Spring was written between 1902 and 1907, the score being revised in 1939. Until this ClassicO revival, it received its last performance at the Queen's Hall Proms in August 1939. The title Spring indicates the colour and character of the work. In contrast to the previous work it is refreshingly bright: a pastoral piece akin to an Enigma variation (Elgar). The Rhapsody opens in 6/4 time with a pastoral call on the oboe, which after development leads into a dance-tune in E major. Virtually all the material of the first section is then repeated in different key and scoring, and an energetic coda finishes the piece off with a flourish of harps and strings. At the time Spring was given by Beecham in March 1909, he wrote to Delius "The concert went off very well, and Austin's Rhapsody had a great success - composer recalled many times and all the rest of it...". And Cyril Scott wrote to Austin "I have not had so much pleasure from a work as I had from yours for many a long day. The Rhapsody is indeed a most important contribution to the musical world .. all spirit of criticism (too fatal to real enjoyment) was annihilated by its excessive Beauty. 1 cannot find words of higher praise - we are indeed proud of you." Austin then conducted the piece in one of Balfour Gardiner's famous series of concerts in April 1912, but in 1938 he revised it quite drastically. The new version used here was first played by the Bournemouth Municipal Orchestra under Austin's son, Richard, in March 1939. Later in the year, Austin conducted it himself at the above-mentioned Prom performance. Since then it has been forgotten and unperformed. I think you will agree that it deserves the airing it is here given so competently by the RNCM with Douglas Bostock. Edgar Bainton, the son of a Congregational Minister, was born in London and brought up in the Warwickshire countryside near Coventry. He won a scholarship to the Royal College of Music at the age of 16, and at 21 was appointed as teacher of composition and piano at the Newcastle Conservatory. He remained at Newcastle, soon becoming Principal. In the summer of 1914 he went on holiday to Germany with musical friends and on the outbreak of War in August found himself interned. He was held, as were the other musicians, at a civilian internment camp near Berlin, not being able to return home until the end of the war. He resumed his work at Newcastle, but in 1933, successfully applied for the post of Director of the New South Wales Conservatorium in Sydney. From 1934 he effectively became an Australian composer. It meant that he was more or less wiped out from the British concert scene, his new works rarely heard, and his earlier British compositions forgotten. Bainton's earliest compositions were songs and piano pieces. His first two extended works for orchestra appeared in quick succession, a tone poem Pompilia given by Henry Wood at Queen's Hall in 1903, and then his first symphony, A Phantasy of Life and Progress at Bournemouth seven days later. Subsequently his music had been largely choral, including The Blessed Damozel (which immediately preceded Before Sunrise in 1907). An opera, Oithona, set in pre-Roman Britain, enjoyed its only production in 1915, when Rutland Boughton produced it at Glastonbury; but unfortunately because he was a wartime internee he never heard it. His later operas, The Crier by Night and The Pearl Tree were never seen in the UK. 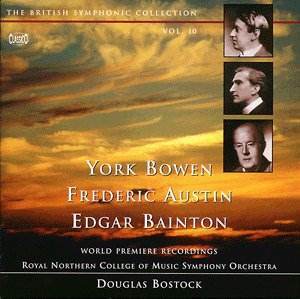 After the war, Bainton won a Carnegie prize for his piano concerto, Concert Fantasia. His anthem, And I Saw a New Heaven is still widely sung and has kept his name in the public eye. Four works were produced at the Three Choirs Festival in the 1920s with one at the Proms, while Dan Godfrey gave performances of six works at Bournemouth. Bainton's orchestral scherzo, Epithalamium of 1929 is a typical example of this music, the idiom reminiscent of Howells' orchestral music of the Twenties, and very much of its day. After he emigrated to Australia in 1934, Bainton produced two fine symphonies in 1938 and 1956, and most curiously, the nostalgic song cycle, An English Idyll, setting words by the Manchester critic, Neville Cardus, a wartime resident of Melbourne. For the last work of the disc we return to a composition of heavier form than the style of Austin. Before Sunrise is a choral symphony, with words set from Swinburne's Songs before Sunrise. This takes as its theme the freeing of humanity from enslavement, the betterment of life and a vision of an idealistic destiny, ending with a setting of Swinburne's A Hymn of Man. On the CD, we hear its first movement, Genesis, which is purely orchestral and was authorised by the composer to be performed separately. Sombre rumblings and undercurrents of disturbing evil forces open the piece. An energetic development follows where different (lighter) thematic ideas are introduced. The movement is headed with the verse: "Slowly the strong sides of the heaving night moved, and brought forth the strength of life and death". A first performance programme note appropriately summarises the first movement as 'a picture of chaos giving birth to Life and Death, the struggle between Life and Death�. An impactful Mahlerian ending with harps and horns is very moving. The Royal Northern College Orchestra handles the scores magnificently. Their competence with delicate filigree at one moment and then fortissimo power the next is breathtaking. The thunderous timpani with accompanying cymbals/gong at the end of the Bainton work is mind-shattering and indicates some skill by the recording engineers in maximising a good effect. Until recently, it has been �fashionable� for colleges of music and the BBC to turn their backs on British composers (before Elgar and after Arne and Boyce) with the accent instead placed on over-promotion of largely uninspired modern-day composers. The RNCM, by involving themselves in this project, have shown that a better balance is now being sought where lesser known 19th Century and early 20th Century composers are being reassessed. We remember Beecham enjoyed a broad repertoire and one hopes that Bostock and others will pick up the baton from where he left off and provide us with more �lost� works.